It's that time of year when I tend to have more weddings and anniversaries to celebrate. So, I decided to build up my stash of these types of cards. Nothing says wedding or anniversary like beautiful metallic papers. Something about the extra shimmer and shine makes a clean and simple layout extra special. 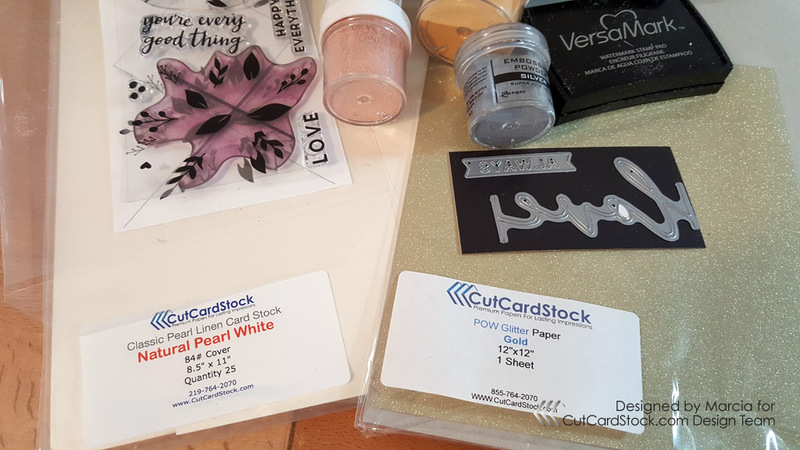 That was my focus for the bases and backgrounds to use the different metallic papers that CutCardStock has to offer. 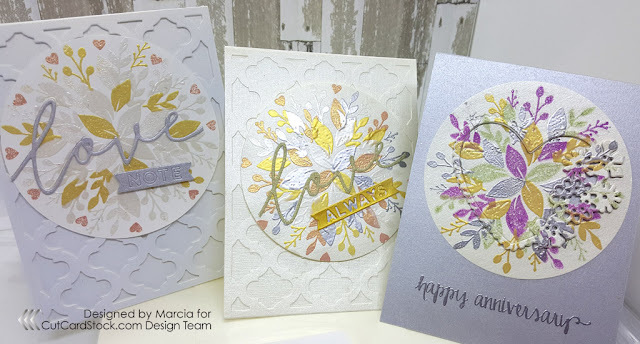 For the card on the left, I used Curious Metallic in Ice Gold for the base and the background. The middle card uses Classic Pearl Linen for the base and background. The one on the left is Stardream Metallic in Silver. 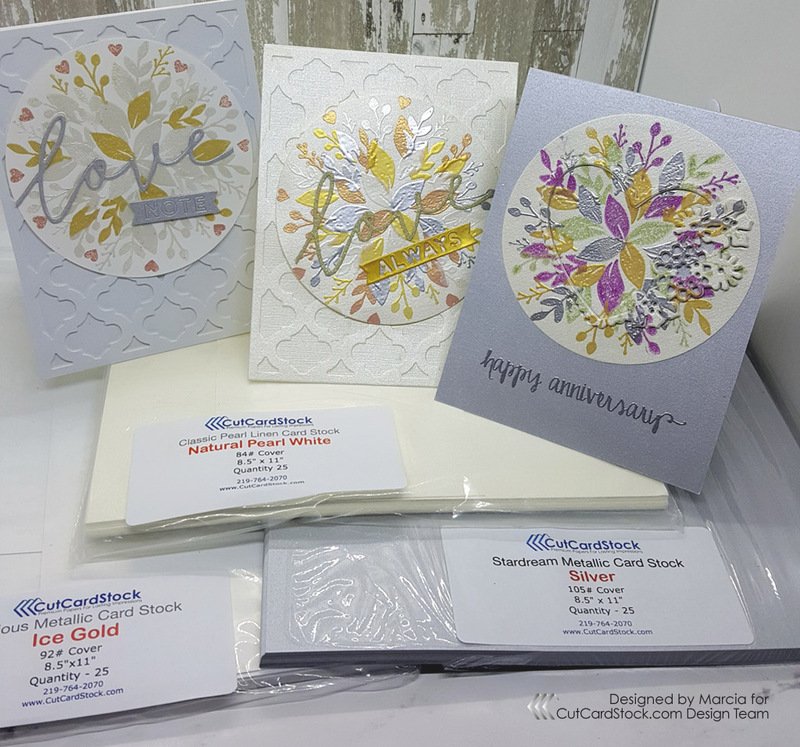 The card stocks are so elegant and downright yummy to look at. Well, at least that's what I think. I just wish the pictures could capture all of that shimmery goodness. On to the cards. . . for two of the cards, I used a die-cut from Birch Press Designs to create the trellis type background. I adhered the background to the card base with Tombow Liquid Glue. 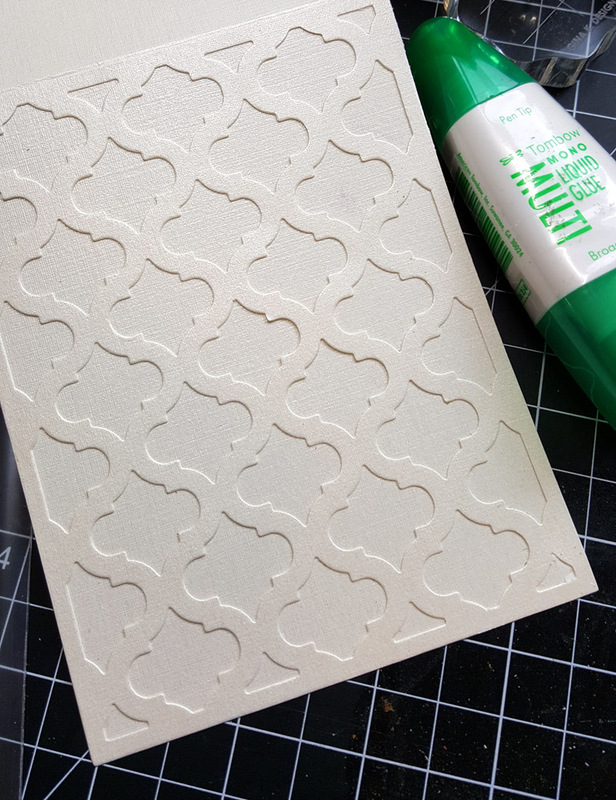 I like using liquid glue for die-cuts like this because it gives you a chance to move the pieces around until they are lined up perfectly. I have used spray adhesive but found it more difficult to get the right alignment. To create the focal image, I used Concord & 9th's Turnabout Wreath and stamped the images on Classic Pearl Linen. The images were stamped with Versamark ink so I could add different metallic embossing powders for additional shimmer. After stamping and embossing, I die-cut the wreath into circles. For the die-cut sentiments, I used the POW Glitter paper in Gold on one card. For the other, I used Stardream Metallic in Silver. 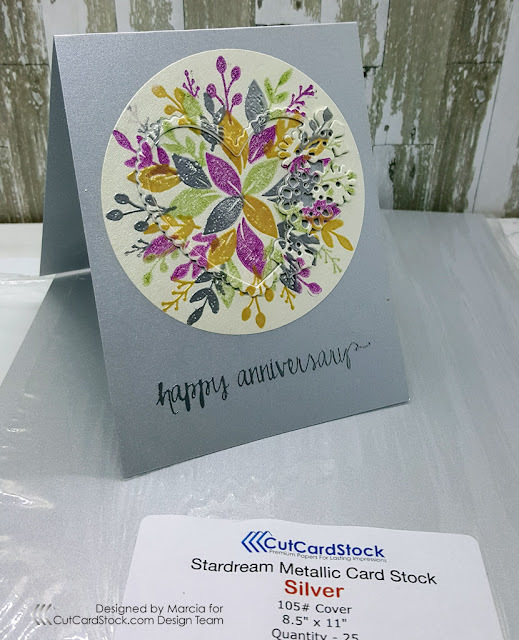 For the anniversary card, I used an additional heart die from Cheapo Dies. I popped up the outside of the heart with adhesive backed foam. For more inspiration from the design team keep scrolling down to check out the other crafty creations. Until next time. . . . inky hugs! !